Another reason I quit violin at an early age. 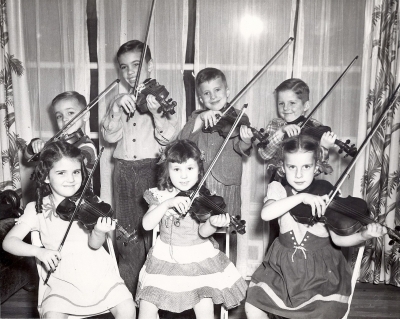 Most everyone here knows from past threads that I started violin at age 4 and more or less had to quit when I was 10 do to the fact that mom couldn't afford rental or lesson's any longer. I was looking a picture today at a picture of a group of us kids taken when I was about 7 or 8. In the photo, I happen to see one of the members of the group, (Harry Klein), his mother was my orchestra teacher in grade school. 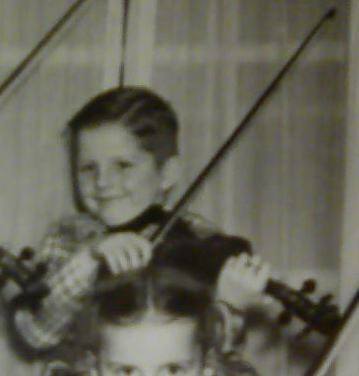 If I remember correctly, Harry went on to be an outstanding violinist and to go on playing in some symphony orchestra somewhere. On a day that we had orchestra class, I got into the music room with no violin, (I forgot it at home that morning). Mrs. Klein asked where my violin was, I told her I forgot it at home. Her response to me was, " well, you just march right back home and get it". Now it was a mile walk back home, mom was working so I couldn't call her to bring it to me. Soooooooo,, I left school, walked the mile back home knowing that when and IF I returned to school for orchestra class that the class would be over. (what was the point?) I decided not to even go back to school. In about one hour, the phone rang and it was my 3rd grade teacher, (Mr Cleveland) wanting to know where I was at and why I wasn't in class. I explained the whole situation to him and he asked if I planned on being there the next day. I told him I would be there. Now, it was pretty boring being home alone, no TV in those days, (at least we didn't have one yet) and so I decided to bake a cake, (no joke), I got out all the ingredients that I read in the cook book and proceeded to make a two layer white cake, even slicing off slivers to use as shims between the layers. (I learned that from mom) Even made my own frosting / icing. I was kinda aggravated at having to walk home to get my violin and so it was that walk home that helped me to decide I wasn't playing the thing anymore. For some reason I can't get my printer to work with Window's 10, so I can't scan the photo to show. I'm not sure if Pierre still has it in his computer. I sent the photo to him a couple years ago so he could crop a picture of me in the group to use as a thumbnail. THE END. And that is a true story. I like it Ken ! Talking of crazy things kids do - on returning home from my very first day at primary school, my mom asked me if I had enjoyed my day. "Yes thanks", I said, "And I'll probably go back tomorrow"...... ha ! OM Gosh, Pierre, you still had / have it, that's awesome.Thanks so much. If anyone is wondering where I am in the photo, I'm the kid in the back row, far right. Harry Klein is far left, the shortest boy in the group. and that was a true story. Aww, that's great ! Glad the pic was found !!! I always love your story. The picture is fabulous.. I am so glad to see it again. So glad that some of the newer members can hear your story. The tallest boy in the back row is, Kenny Knepper, his sister, Nellie is front row right. This photo was taken in the living room of the Kneppers home. They lived in a beautiful two story home that backed up the grade school property that we all attended then. The Kneppers home was surrounded by a huge apple orchard, Mr. Knepper was also a bee keeper and had several bee hives. I loved going there on Saturday morning's for my lesson with a private teacher, Mrs. Wandless. After my lesson, Mrs. Knepper would break out her home made bread and a block / brick of fresh honey (still in the wooden frame) and I would sit there smearing fresh honey on her home made bread. I really loved eating the honey bread because the honey was still in the waxy comb. I don't remember the other's in the photo, two girls in the front row and the other boy on my right in the back row, it's probably been 65+ years since then. This morning I drove past the corner where their house used to be, on my way to get a haircut. My barber of almost 40 years and I talked about the old corner. Oh, the memories.. where has the time gone. Good looking kid. 🙂 I like your bow hold too but you need to get that right elbow up. LOL, I know, the kid to your right was too close for that. Everyone in the back row is crowded for elbow room. That's so funny that you decided to bake a cake because you were bored. I doubt many kids today would do that, or if they did, they'd burn the house down. Sounds like you knew what you were doing. Actually, Diane / KindaScratchy, If I remember correctly, I think I baked the cake to kinda un- ruffle my moms feathers cuz I figured she'd be upset that I stayed home. But she actually sided with me, she thought it was a dumb thing to do to send me home to get it. This is the first time I've told that story, so it's no wonder you don't remember it.